“High above the sky stands Swarga, paradise, abode of the gods. Still above is Vaikuntha, heaven, abode of God. Brilliantly using a series of 250 line drawings and notes on the various regional versions of the great epic, Devdutt Pattanaik skilfully presents an intriguing and captivating retelling of the Mahabharata. Vyasa’s sanskrit epic, which was originally known as Jaya, is analysed by Pattanaik on various levels. The original versions give the events as they supposedly unfolded. This version however, not only gives the causes and effects for the events, it also brings forth the important lessons that were meant to be learnt from these events. The author adds interesting unknown facts like Draupadi’s secret love for Karna, her husbands’ arch enemy, that never found a place in the many versions that exist. 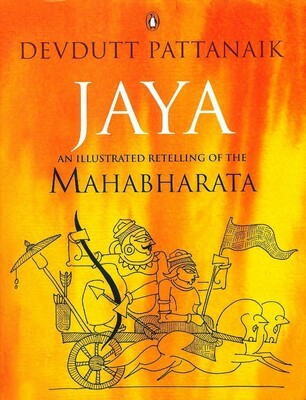 Devdutt Pattanaik known for his expertise in the field of mythology, does not let the reader down. This brilliantly researched and equally brilliantly presented book is a book that everyone will enjoy. This entry was posted on October 30, 2014 by artikabakshi in Book Reviews, Contemporary, Fiction and tagged Devdutt Pattanaik, Jaya.